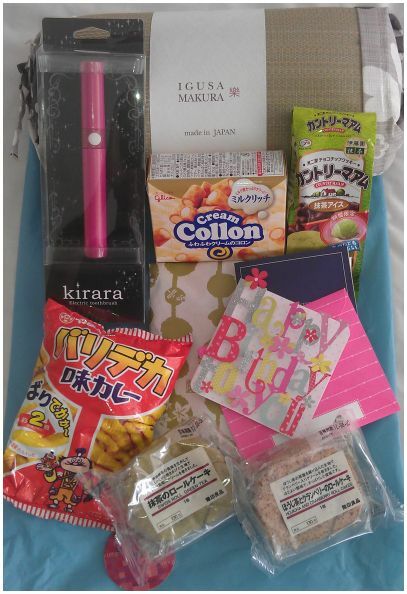 The package included some lovely snacks, such as Muji sponge cakes - one green tea and the other cranberry flavour; potato sticks and green tea flavoured biscuits filled with chocolate. There were also some cream biscuits - I'm sure everything will be yummy... well actually I already ate the Muji cakes and they were scrumptious. (I want some more now). The most special item is the japanese IGUSA MAKURA, igusa is a type of Japanese rush and makura means pillow. The igusa makura pillow is usually filled with beans and covered with woven soft rush. This type of igusa/rush is also the material used for tatami mats in japan. And how could I forget the birthday card. Japanese cards are so delicate and amazing and I think a treasure all on their own.